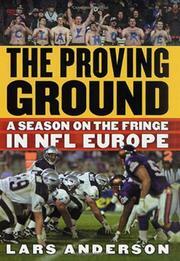 A lively, discursive account of American-style football as it expands its European fan base. Anderson (co-author, Pickup Artists, 1998) spent the spring of 2000 with the Scottish Claymores, one of six teams in the NFL Europe league. He had access to the team’s practices in Glasgow and traveled to games in Berlin, Frankfurt, Düsseldorf, Amsterdam, and Barcelona. A Sports Illustrated writer, he’s at his best when covering the origin and growth of the league. Developed by the NFL in the late 1980s as a response to the global growth of the NBA in the Magic/Bird/Jordan era, the World League of American Football had teams scattered over eight time zones. By 1995, the WLAF had evolved into NFL Europe, which succeeds today as a training ground for the domestic league. (Underused rookies, rehabilitating veterans, ambitious coaches, and even referees work in Europe, knowing that game videotape will be carefully analyzed in the US.) On the initial 2000 NFL rosters, 159 players were veterans of Europe, including Super Bowl Quarterback Kurt Warner. The author demonstrates the low-budget atmosphere of the league, e.g., the Glasgow hotel housing the team has small rooms, nasty food, and computer-incompatible phone lines. Anderson portrays so many people that none emerges as a compelling protagonist. Only Jim Criner, the unlikable head coach, receives extensive attention. Light-hearted moments are based on cultural differences, such as Ziggy, a German bus driver, mistaking the team for a wedding party and taking them to a Frankfurt reception instead of the Düsseldorf stadium. And Nachi Abe, one of two Japanese players on the team, rejoices in his one-member fan club. In his accounts of the Claymore’s ten regular season games and the concluding World Bowl, Anderson ably captures the excitement of the play.